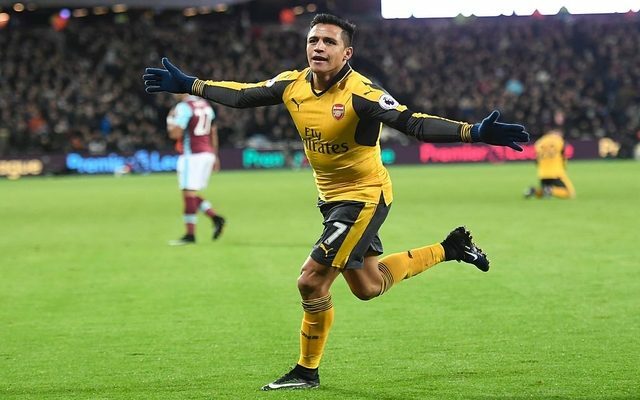 Alexis Sanchez led Arsenal to a 5-1 win over West Ham United on Saturday with a world-class hat-trick to move the Gunners back to within three points of top spot in the Premier League. Alex Oxlade-Chamberlain and Mesut Ozil were also on target, while Andy Carroll grabbed a goal for the hosts which ended up being nothing more than a consolation effort. Not overly busy and couldn’t do much to deny the goal but was alert to any danger that came his way. Did well filling in at right back as he produced a solid defensive performance and tried to get forward whenever possible. Very impressive in the circumstances. Relatively untroubled but produced a solid display and was key in keeping the West Ham forwards quiet. A commanding performance for the most part as he led by example and dealt with any danger both in the air and on the ground. Defensively efficient and was always flying down the left flank on the overlap giving his teammates an option. If being critical, could of done better picking out players in the box after getting in such dangerous positions. Worked tirelessly off the ball and provided defensive coverage to limit West Ham’s ability to put the Arsenal backline under sustained pressure. A calming influence in midfield in possession and wasn’t afraid to put his foot in. A solid performance from the midfield general. Replaced with over 20 minutes to go as he was far too quiet in a game that he should have thrived in with Arsenal threatening on the counter attack. On the scoresheet again and was a creative spark for his side while working hard off the ball. A solid display from the German international but could be more influential. Frustrating at times but scored a brilliant goal to help Arsenal seal the win. Needs to be more decisive in the final third but a constant threat for the visitors. The Chilean international was absolutely superb. Three brilliant goals and an assist, he’s now been involved in 24 goals in his last 24 Premier League games. Priceless. Gave Arsenal presence in midfield and helped them see out the win. Brought on to provide solidity in midfield, but limited minutes.